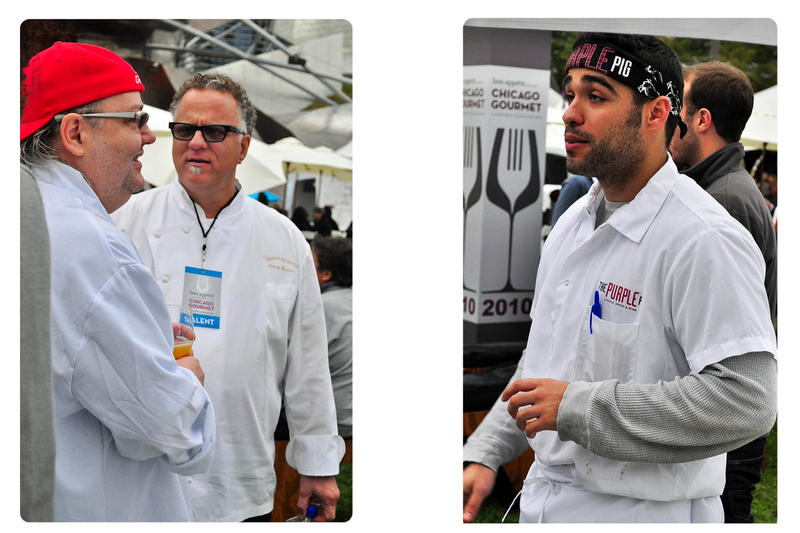 Chicago Gourmet ‘happened’ to coincide with our trip to Chicago. Being as cheap as I am, I waited for Groupon to feature it and then proceeded to get them half off. Of course, they only offered the less appealing date of Sunday, September 26 (based on the schedule), but since I was only paying a fraction of the regular price, I felt it could potentially be fair. E & I showed up about 45 minutes early (directly from Bongo Room, I might add! ), but were greeted with the first of many line-rides. Luckily, it was a bit better organized than I was expecting; with a unique line for other cheapskates like myself in the Groupon Line. This line was the fastest moving line, unfortunately. Once we were in, it was a swarm of people trying to get at scraps at each pavilion. We started out near the Allen Brothers Tasting Pavilion. Mayhem! These were potentially the shortest line, but even about 20 minutes after the start of the event, lines were snaking through Millennium Park, requiring upwards of 30 minute waits. I managed to grab a plate to share with E and found a nice support post to eat on. I knew from that moment on that it was going to be a long day (if I wanted to leave full). 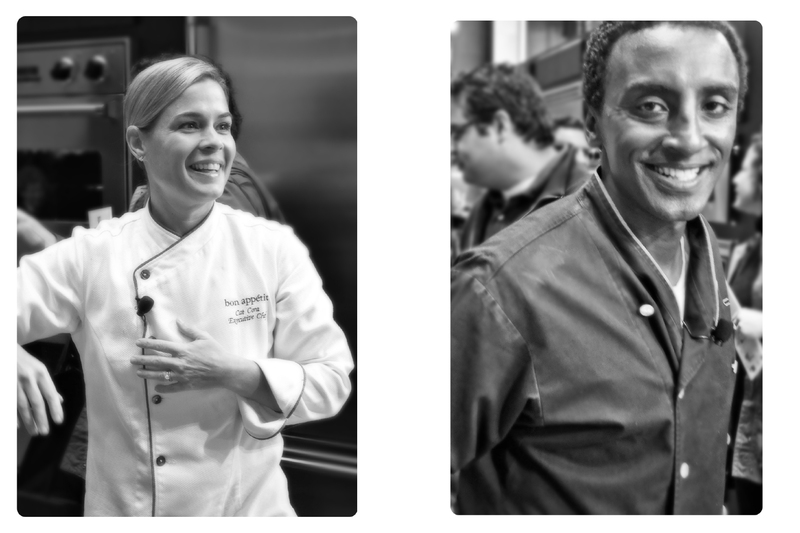 After our first bites, we decided to catch a Living Cooking Demonstration by Cat Cora and Marcus Samuelsson (two of the main reasons I decided to fork out $90 per person to attend this party). It was a lot of fun, mainly for the celebrity factor, but I didn’t feel like they stretched their culinary muscles at all. 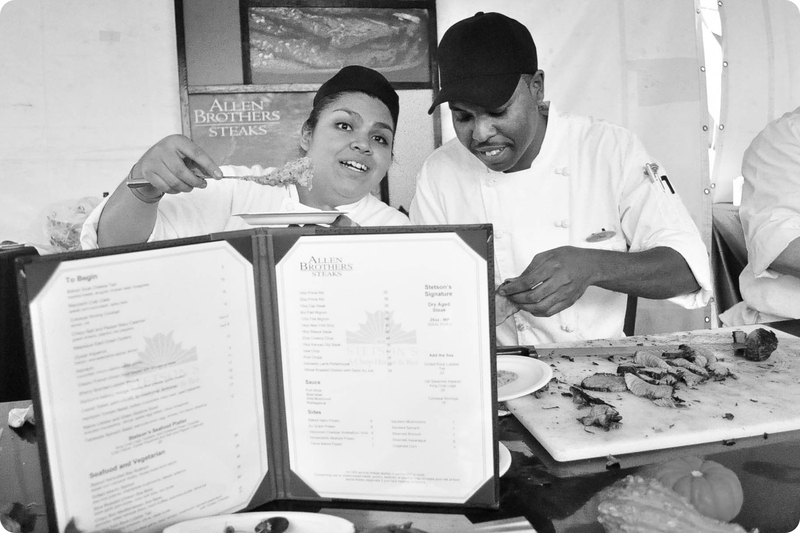 Each chef was hawking a new book more than anything else. 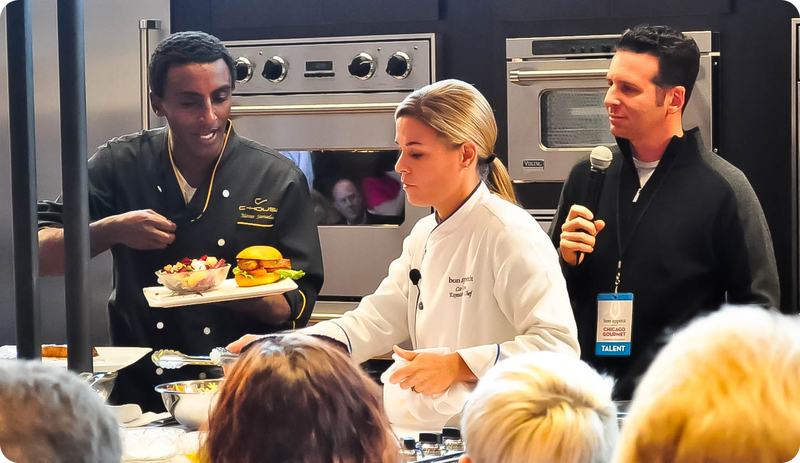 After creating a burger (Samuelsson) and a puree (Cora), they handed it to two lucky winners, while the rest of us could do nothing but drool 😦 (and have our stomachs growl). P.S. The demo mirrors were a failure. They were all heat damaged and warped. Nothing could be seen with them. 1 hour in. 3 bites of food. 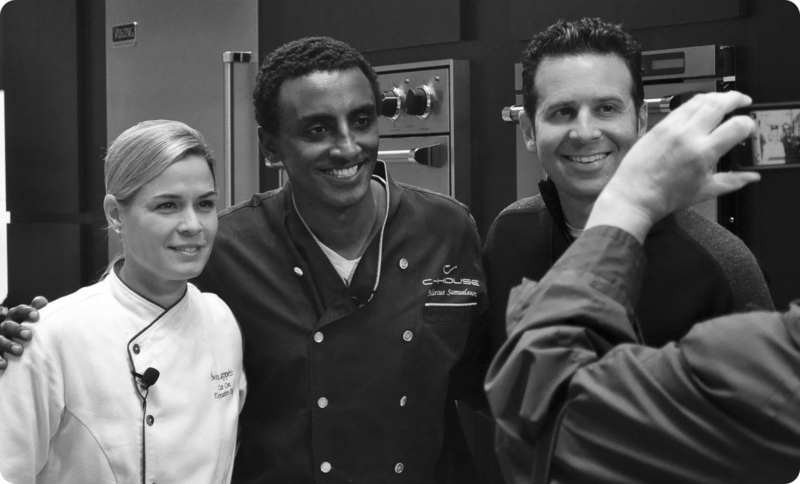 But I got some great pictures with Cat Cora and Marcus Samuelsson. Desperate times called for desperate measures. E & I tackled a couple of more pavilions and snuck out with some pretty mediocre pulled pork sandwiches and a brilliantly coloured roasted fish (which was actually quite strong – Chef Dirk Flanigan’s Henri entry). 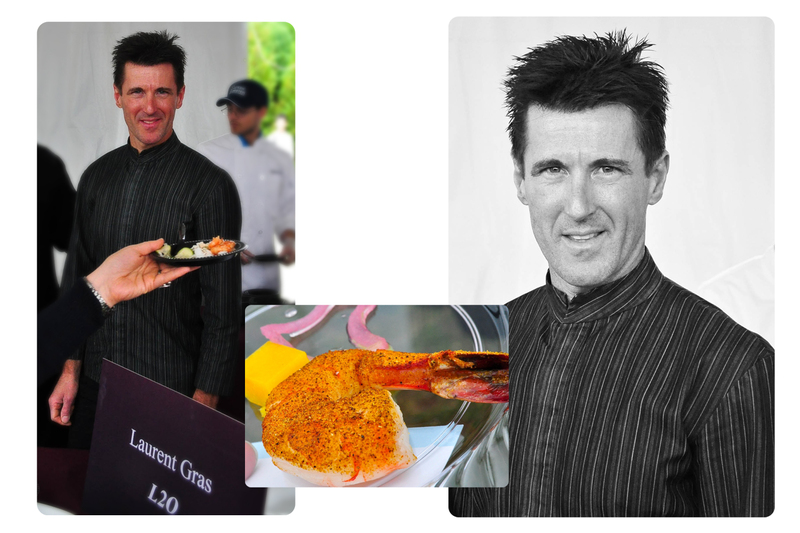 Chef Flanigan was gracious and a pleasure to take photos of. He noted that my sample didn’t have any cilantro flowers and promptly picked some from his prep station and placed it atop my fish. Yay! 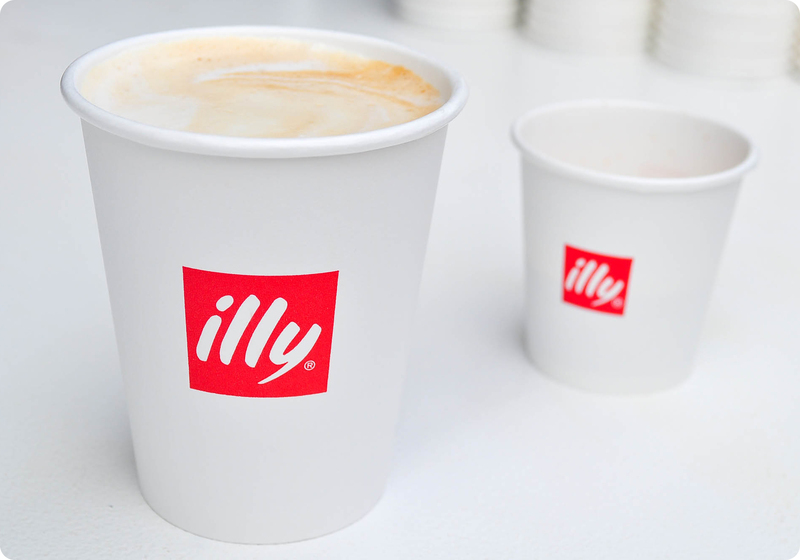 I impulsively got into the next line I saw and realized afterward that I lined up for 10 minutes for a cup of Illy Coffee. Boo. So by now, we had missed Asian Indulgence (a Cooking Demo featuring Takashi Yagihashi of Takashi and Jackie Shen of Red Light), which I had hoped to see (since I canceled a Brunch reservation at Takashi to fit in this festival; brilliant idea re: Ramen for Brunch though!) and about 1/2 of the food tastings, since the Tasting Pavilions had two tasting sessions (one from 12:00PM, and the second session from 2:30PM onward) and it was about 1:30PM and I had to make my way to the other must-hit seminar for me: Demystifying Beef (with Andrew Knowlton of Bon Appetit). Getting to the tent was quite an event as well, since none of the volunteers I asked could tell me where it was. Boo. But I did find a roast pig – Score! But the line was too long (typical). OK, so if anyone knows me, they pretty much know I have my disagreements with Knowlton on the state of Dining Out. He believes that one shouldn’t split cheques with credit cards, and that online reviews will never amount to much (not at least compared to his Bon Appetit column, I suppose). I think that he might want to reassess the digital age. Anyway, back to the seminar: I have always wondered about beef (what’s the best cut? What cut do you use for what purpose? What is the difference between dry-aging and wet-aging? Should I be buying corn-fed, or grass-fed? What do I use if I want value? ), so I thought this would be a great chance to learn something. I was wrong. 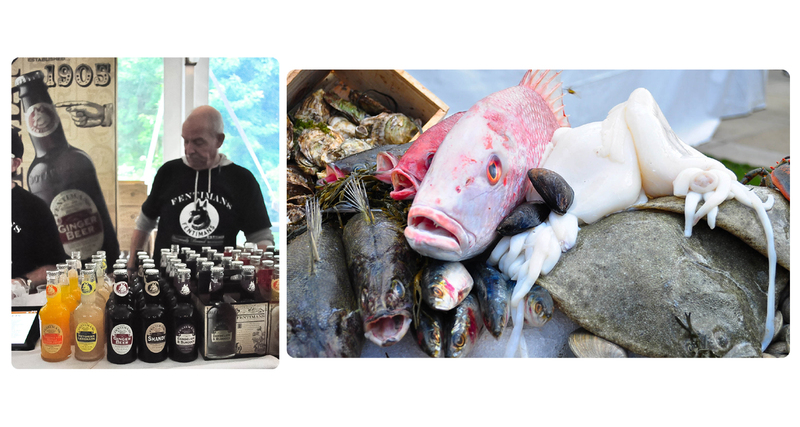 So there were some Big Wigs that attended the seminar (Gibsons Restaurant Group’s Randy Waidner, Keefer’s John Hoga, and Morton’s Claus Fritsch – whose credentials I don’t really even understand to be honest), and of course Knowlton. But no one seemed to offer any new information. They had some really sad looking meat lying around, none of which was alluded to during their presentation (except to laugh at the frozen burger patty). Knowlton admitted that he had higher hopes for the seminar (so did I!) and that he had originally wanted samples of different types and cuts of meat to be handed out during the presentation so that we could actually have a tangible sense of what they were trying to teach us. But of course, he found out that Bon Appetit was cheap…err… it was not logistically possible. So we all just sat there at tables with a few slabs of meat on the head table and the guys chatted it up with one another saying how hanger steak was awesome and good value (tell me something I don’t know), dry-aging is awesome (yes….) and that you shouldn’t buy hamburger meat (thanks guys!). One thing I did learn was that I could potentially dry-age/wet-age my own meat in my refrigerator with some paper towels (yum!). I’ll have to try that out sometime. I just have to remember to trim off the green stuff before cooking. So here’s a summary of some points they made (the only really helpful information they provided). And you’re welcome. I just saved you $90. Use Bounty Towels to do your own aging in your fridge (just change the towels periodically when it is no longer absorbent). After 7-10 days in the fridge, trim the steaks. Parchment paper prevents blood from oozing out of the towels and infecting your fridge with contaminants. For the perfect burger, use a ratio of 75/25 meat/fat ratio (suggestions include Brisket, Chuck, or Short-rib all with a 3 week age). Grind it yourself/ask your butcher. Do not over-pack your beef when forming patties. 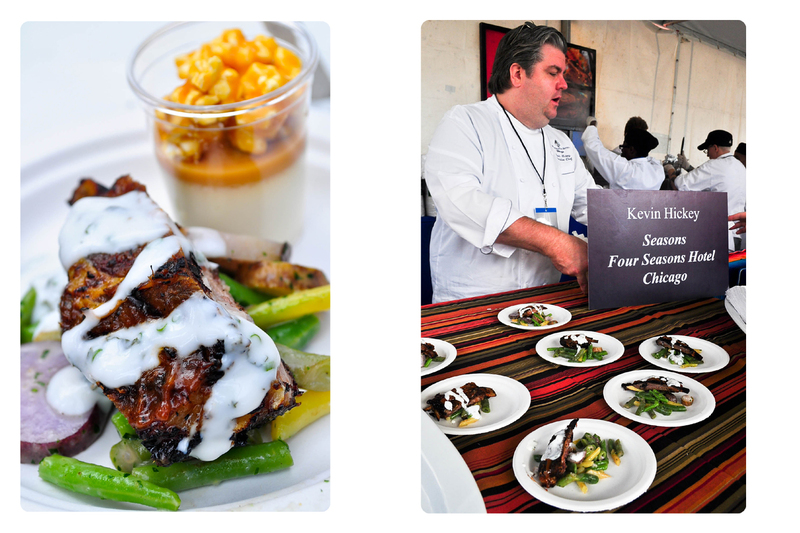 The standout dishes so far during the event were Chef Gras’ Cajun spiced shrimp (served chilled), the grilled Lamb Rib from Four Seasons’ Chef Hickey and a fish dish by Chef Flanigan of Henri. Everything else was pretty mediocre. So by now it was 2:30 PM. I have stared at more food than I’ve ingested. I had 1 lamb chop in me, some mousse, a single shrimp and some cured and roasted fish. Strangely, I was more tired than hungry. I headed toward the lovely roasted pig that distracted me earlier. After some roast pig that was smothered in a too-heavy BBQ sauce, I headed into the ‘sell-out’ FoodSpring.com Specialty Food Pavilion (where mass-produced products are hawked to passerby’s). We decided to try and get some food here because we were obviously failing elsewhere. As expected, this place was avoided by most attendees of the Gourmet Festival. They had quite a selection of All-Natural/Organic produce (including Fentimann’s – one of my new favourite colas), which was unexpected and nice. I felt a little bad for them because they tried so hard to win what customers trickled in, because no one came to their pavilion. I doubt that this pavilion will have many vendors next year. On a positive note: I did find a delightful Ginger Beer brand called Fever Tree (try it! I loved it). E & I both voted for it to win among 30 different entries for the Sofi Awards. Weird! After having another bite of the BBQ pork sans sauce (I really thought it was overpowering), I was disappointed. It tasted almost steamed: The meat was moist, but lacking of flavour/sweetness. I guess there was a reason for the bombastic usage of sauce after all. After roasting that pig for 16 hours, one would think it could stand alone and be worth the effort. 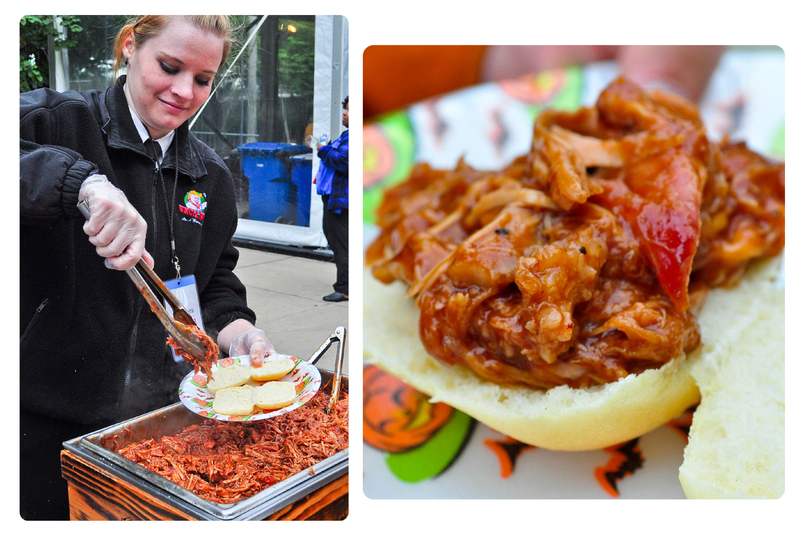 I spoke with the Pit Master and he confessed that the skin was inedible at that point and that only the meat was good. 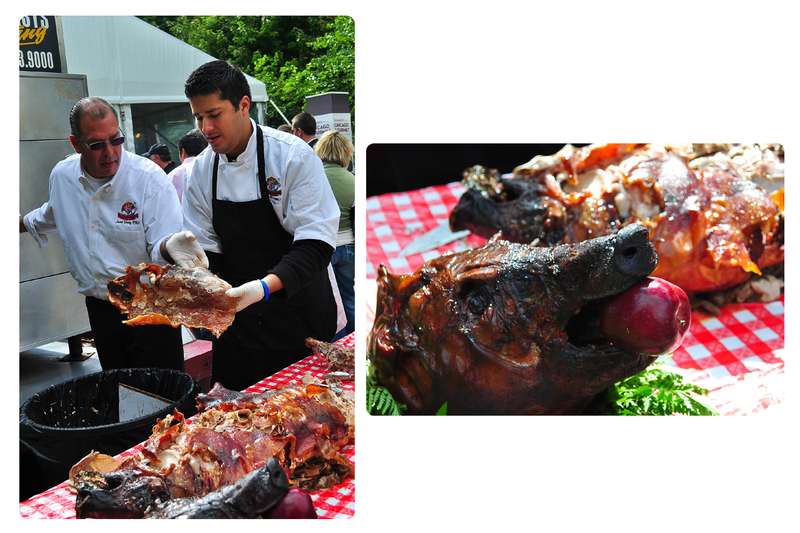 I didn’t get to try the skin, but from my tasting of the meat, I’d have to say the meat is almost inedible as well. They really need to check out some finer points of BBQ/Roasting from Chinese BBQ Masters (Ho Ho BBQ in Scarborough, Ontario, Canada is the best for me right now). 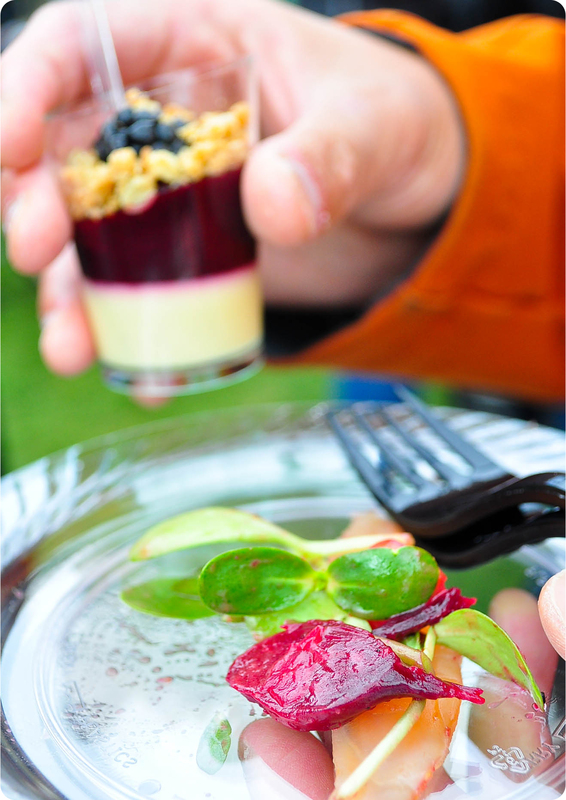 Before attending Chef Art Smith’s cooking from your roots demo, we snagged a few more treats. One was a cheesecake from those cool looking guys that didn’t have the conventional “I-bake-pink-desserts” look – which was awesome. Their cheesecake was also stellar. 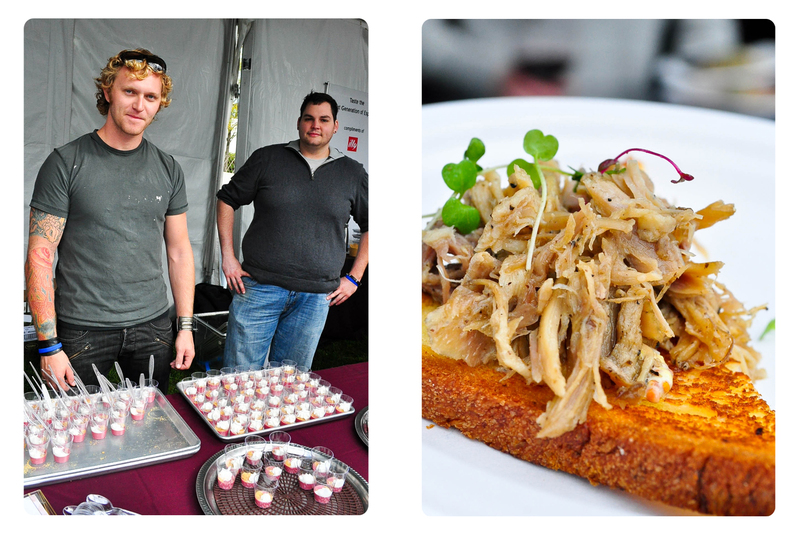 The stale toast with pork on top was a failure though (soggy and dry! How did they accomplish that?). Next up was Art’s lecture on “Cooking from your Roots”, which was really just an infomercial for getting a personal in-home dietitian. 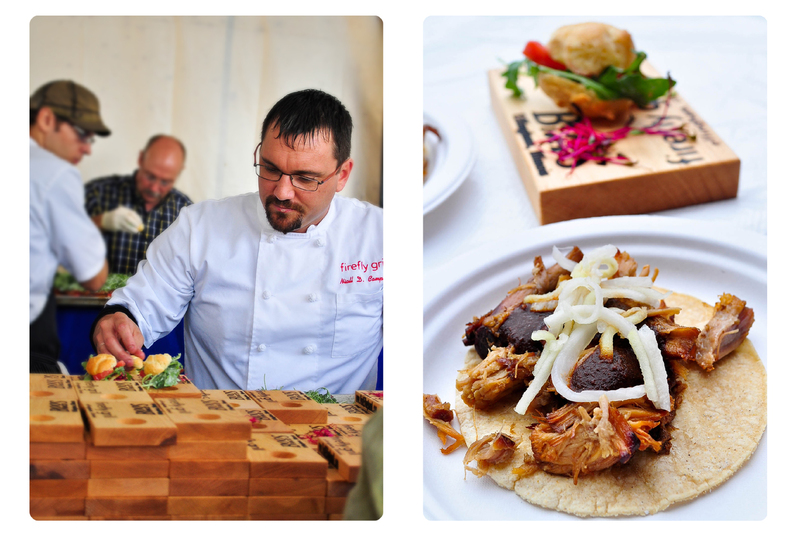 Chef Smith informed us colourfully that he had recently lost about 100lbs (I immediately noticed this when I saw him on stage – “Who’s that? Art? !”) – Good for him! However, the demo was tragic and only showed him bossing around a poor sous-chef/student who ended up doing the actual cooking. He spent the rest of the demo talking about his dietitian. In the end, he taught us how to make lo-mein. Not even good lo-mein. And how exactly is that cooking from his roots, again? 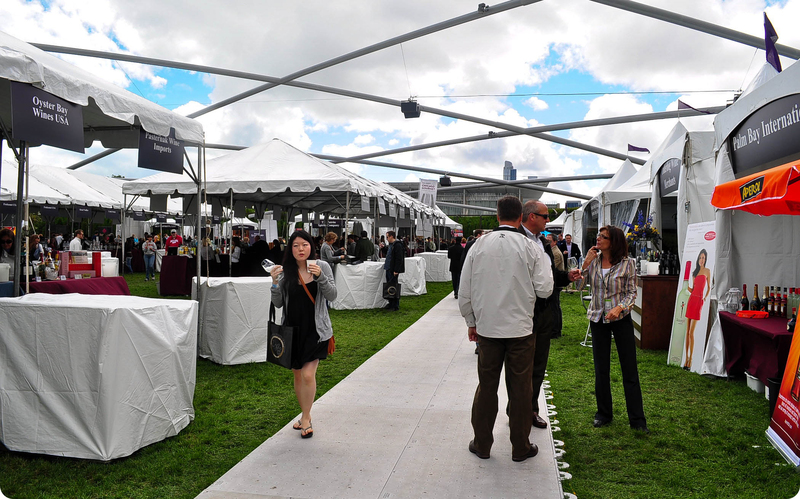 The event was just about wrapping up, so E & I made one last round of the tents and settled into a line at the Allen Brothers Tasting Pavilion (Part Deux) to get some tasty sweatbreads and yummy roasted meat. These were actually two of the strongest dishes of the afternoon and it was nice to end on a rather positive note. 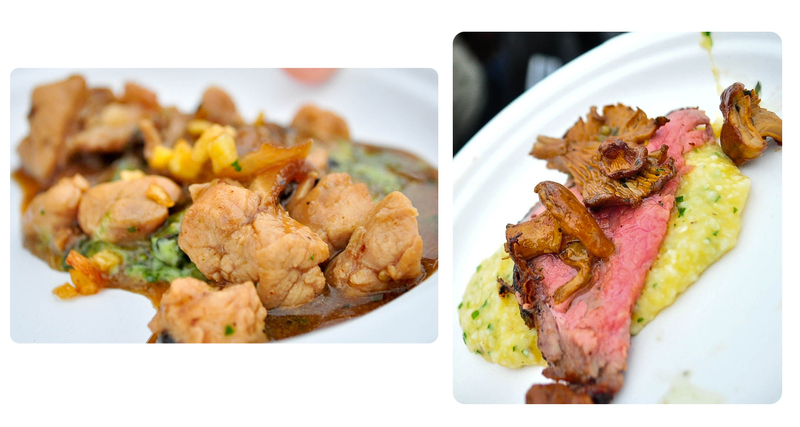 The sweetbreads were smothered in a rich gravy, and the beef had a savoury mushroom sauce. 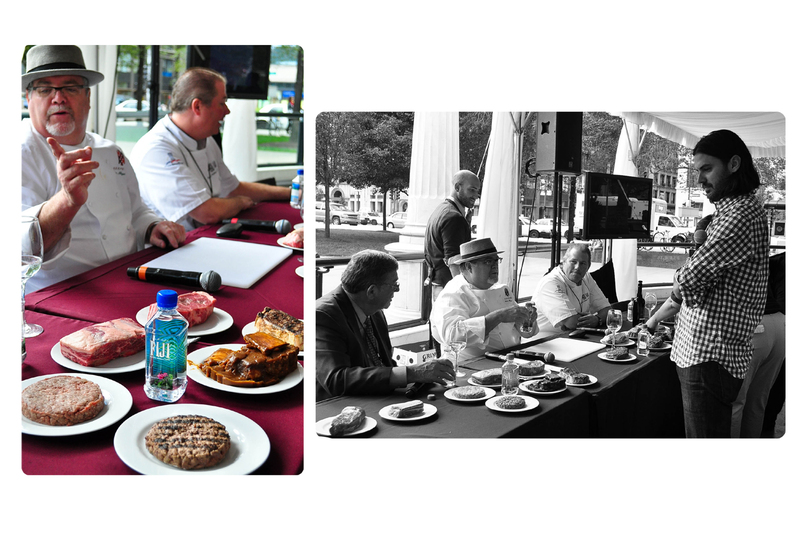 I definitely enjoyed those two samplings (Allen Brothers Steaks by Chef Thomas Heinrich from Stetson’s Chop House & Bar). Overall, I felt it was like a cash grab, which left a sour taste in my mouth. I felt the event was horrendously oversold, or at least poorly managed for the volume of attendees they were expecting (my first worry was when there were over 2000 groupons sold for Sunday alone). Some suggestions for future years (not that I’ll be attending, nor would I recommend anyone to attend), would be to have people line up for one line and then just have the food in one giant snaking pavilion. 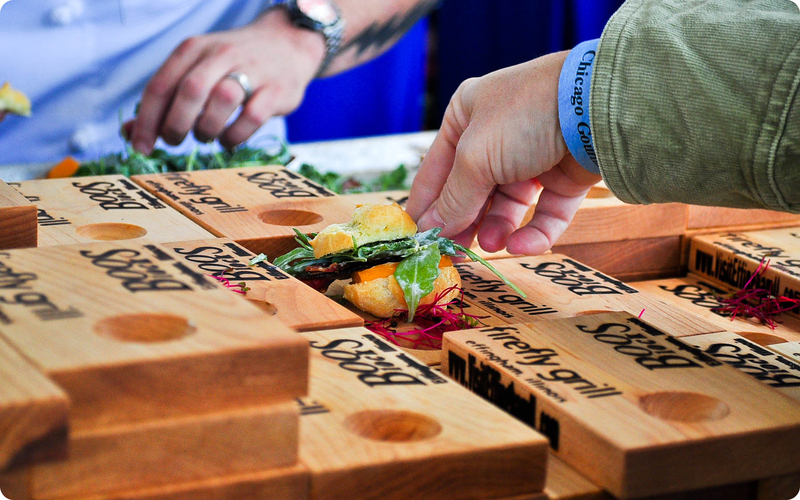 This way, people will only have to line up for 1 line and get multiple dishes; instead of lining up for one tiny morsel just to scramble to the next line. One downfall I foresee is the execution of the Asian & French Pavilion, which E & I were not prepared to line up for. The line extended for a solid 1/4 mile and weaved out of the park. If we had gotten in line for that, we probably would have missed 1/2 the event. Judging by how certain vendors ran out of food early, one might even have lined up for a big screen to be put in front of their faces without a word – signaling the food had run out. Classy guys. Really classy. Yes, so all in all, I regretted purchasing tickets (even at 1/2 priced Groupon prices) and wouldn’t recommend it to anyone going forth. The only reason to go is if you can drink a lot of alcohol. At that point, it may just be worth it. 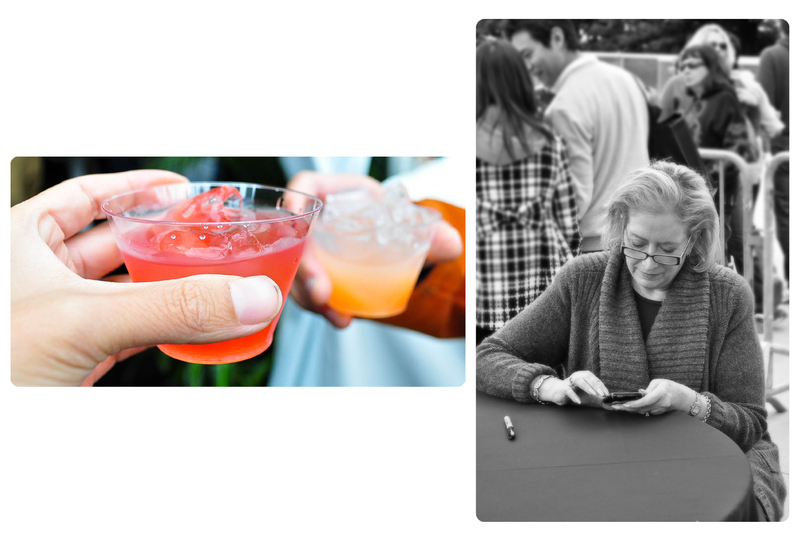 Since I have a severe alcohol intolerance, I had to skip that portion of the event. Thanks to J & A from EatADuckIMust for trying to warn me (sorry for not listening!). 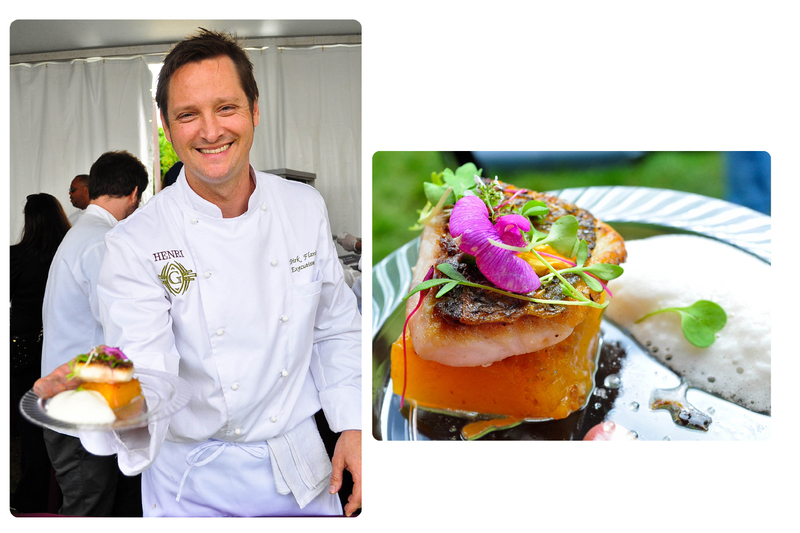 I should have known better (Fairs are never a success), but the celebrity chef promise was too much for me to turn down. Total hours spent in line: 4 hrs. 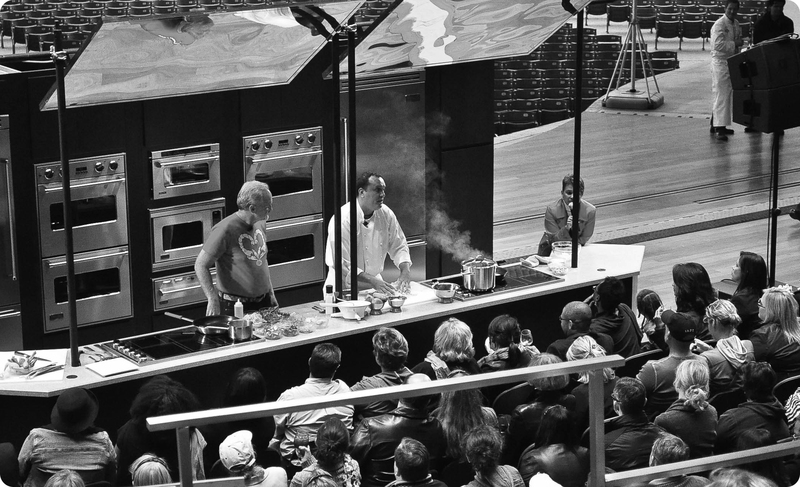 Total hours spent watching Live Cooking Demos (with no food): 2 hrs. Number of food samples: 13 shared among 2. Photos with/of celebrity Chefs: 4. Total $ spent: $180. Overall value: Pretty low. That was very informative. Again, I have to say I love you photos. Too bad it was a bomb. But I enjoy reading your commentaries. Thank you. Thanks for the kind words, Shirley. I will continue to try and put out a quality product. Thank you very much! 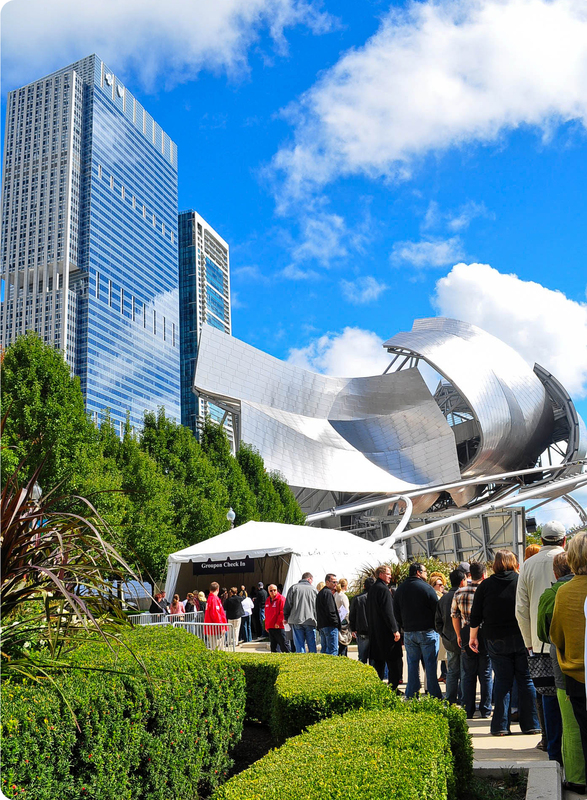 I’m glad you enjoyed reading my post about Chicago Gourmet!! 🙂 Your support is very much appreciated! Thanks for the honest opinion. I agree 100% with your comments. I will review your blog before I go anywhere to try out things. Please keep them coming. Marvellous eating adventures….. Thank you Bill!! Your kind words are very supportive :). I’ll definitely keep the posts coming. I aim to get at least 3 posts out per week. Cheers! Amazing review. I wish I went to the event, but couldn’t justify the cost. After looking at this post, I immediately regret my decision. Photos are amazing, would you mind sharing what camera you shoot with? Thanks so much for the kind words, Justin! And thanks for stopping by. I just started shooting with my new camera – D5000 by Nikon. It’s a nice starter camera and it does everything I need it to do. It’s fun and easy to play around with. If you have any further questions, don’t hesitate to ask.